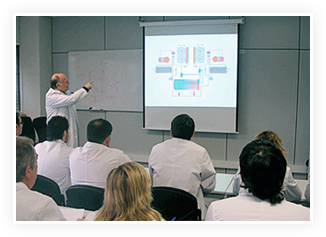 At HITECSA we make technical training for our products available to professionals. The aim of the HITECSA SCHOOL is to organise training courses taught by highly-qualified in-house personnel. The common objective is that the facilities are ideal for each specific case and that your comfort and subsequent maintenance are optimal. The training is classified in three types of modules where the different courses that can be taught are presented. These courses require attendance and, for some of them, no specific prior knowledge is required. 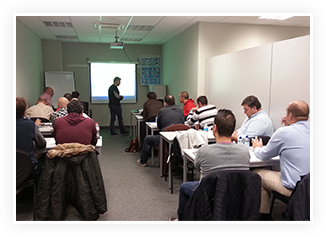 The classes are held in the training room at the Vilanova i la Geltrú (Barcelona) plant. Where necessary, they may also be held in the training room at the Central Office. In such cases it is recommended to check beforehand. The HITECSA SCHOOL training courses are aimed at: installation staff, maintenance staff, repair staff, HITECSA Technical Support agents and customers in general. Each participant will receive the specific material to follow each course. Upon completion, the participants will receive a certificate for the course they attended. The hours are flexible depending on the number of participants, the length of the course and the availability of professionals teaching the classes. The participant must specify in the application their available times and if they prefer mornings or afternoons. To register, each participant must complete the application form. They will then receive confirmation of their registration. There is a maximum and minimum number of places for each course. In the email subject please specify 'Training Courses'.